Fairy Birdfeeder Statement Piece for Fairy Gardens - 37.5" Tall! 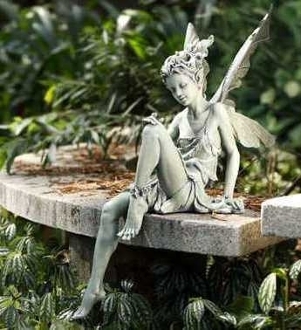 Our Products >> Fairy Birdfeeder Statement Piece for Fairy Gardens - 37.5" Tall! Fairy Birdfeeder Statement Piece for Fairy Gardens - 37.5" Tall! Dimensions: 21.0L X 13.0W X 37.5H. Make a WOW-WOW-WOW Factor in your garden - stunning! Almost lifesize! Sculpture allows for birdseed if you choose!